The Lip Lift resulted in a dramatic transformation of this patient's expression. A Lip Lift generally refers to an 'Upper Lift Lift' and is a surgical procedure that elevates the position of the upper lip to create a more youthful and relaxed smile. However, there are two types of Lip Lifts: Upper Lip Lift and a Corner Lip Lift. Upper Lip Lift - shortens the skin distance that is between the upper lip and the base of the nose. This increases the amount of 'pink lip' that is seen, exposes the teeth more, and gives you fuller, more youthful looking lips. Corner Lip Lift - involves only the edges of your mouth and is designed for the patient who feels as though they have a permanent frown. The Upper Lip Lift is more common than the Corner Lip Lift, but if a patient is concerned about both the fullness and excess distance between the nose and the upper lift as well as a 'permanent frown' expression, the two procedures may be performed together. What problems does a Lip Lift address? Who benefits most from an Upper Lip Lift? Patients of all ages can benefit from the Upper Lip Lift procedure. Some of us are born with a long space above the upper lip while other people acquire this look with age. No matter what your age, this procedure is designed to shorten the space above the upper lip. Even patients in their twenties undergo this procedure with fantastic results. If your lips are not as full as you would like and you have a long space above your lip, you will likely benefit from this procedure. In addition, patients who experience the phenomenon known as 'duck lips' after filler injections, will see a vast improvement with a Lip Lift procedure. After a Lip Lift procedure, lip fillers should no longer result in duck lips. How much space is considered to be 'too long'? The ideal length of the space between your nose and the vermilion border of the upper lip varies with gender. For females, this length usually ranges from 1.0-1.2 cm. Males typically have a longer space averaging 1.3 cm-1.5 cm. The amount of space longer than that measurement is considered to be the excess part. As we age, all the bones of the body (including the face) retract and diminish allowing the flesh of the face to hang more. The soft tissue and fat of the face undergo atrophy so the skin itself also falls. The aged upper lip is characterized by a thin or non-existent vermilion (the pink lip part) and a resting smile that does not show teeth. An ideal, youthful lip is often full and slightly pouting. The pink part of the lip should ideally be 1/3 to 1/2 the volume of the 'mustache' area in general. Lip lift procedures are performed in the office under local anesthesia. IV anesthesia is not required as the procedure is well tolerated by only numbing the area. I perform the Upper Lip Lift by excising only skin at the base of the nose. I do not cut muscles or nerves, as I believe that these facial elements should remain in their natural state. An incision is placed directly beneath the nose and a small strip of skin and tissue is removed. The lip is elevated to its new position exposing about 1/8" of teeth and permanently increasing the volume of the pink part of the lip. The procedure takes about ninety minutes. The result of the lip lift is a more youthful and pleasant shape to the mouth and lips. The teeth will show more and the patient almost always looks happier and relaxed. To learn more about how I perform the pre-op Lip Lift markings please see my blog post with a short video clip here. 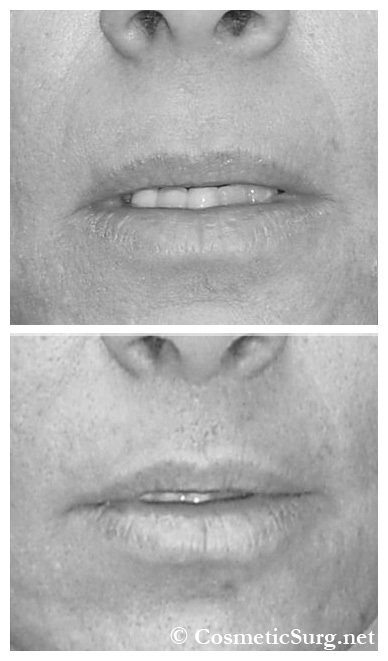 How much skin is removed in the Upper Lip Lift procedure? The amount of skin removed varies with gender and is customized for each patient. The distance between the nose and the top of the vermillion border of the upper lip is measured prior to the surgery. For females, I usually remove the amount greater than 1.2 cm and for males I typically remove the amount of skin greater than 1.5 cm. For example, if the measured distance from bottom of nose to top lip vermilion is 2.0 cm, and your ideal length is 1.5 cm, I will remove 5 mm of skin (2.0 cm - 1.5 cm = .5 cm = 5 mm). As mentioned above, I remove only skin in order to lift your Upper Lip. I do not cut muscles or nerves, as I do not believe in upsetting the integrity of the nerves or muscles and cutting either introduces an added dimension of complexity and risk, which is absolutely unnecessary to achieving fuller, more youthful lips! You can read more about my skin only technique in my blog. I have been performing the skin only technique my entire career and I have been very happy with my patient's results. Even more importantly, my patients are very happy with their results. How is the Corner Lip Lift performed? The Corner Lip Lift is also an out patient procedure which is performed under local anesthesia. It can be performed as a solo procedure, or in combination with the Upper Lip Lift procedure. This Corner Lip Lift diagram illustrates the "Wedge Excision" used during the procedure. The edges of each corner of the mouth are lifted slightly with dissolvable sutures. This surgical procedure is also sometimes referred to as "smile surgery" and while it differs quite a bit from the Upper Lip Lift, it has a few similarities. Like the Upper Lip Lift procedure, I only lift skin and do not touch muscles or nerves. Both procedures are also very subtle movements that, when done correctly, do not affect your ability to show a range of facial expressions. Generally speaking, your surgeon should be careful not to extend the excised wedge laterally or this will result in a Joker smile! I am very careful to ensure that this does not happen. To learn more about this procedure please read my blog post on Smile Surgery. Can Lips be lifted with fillers? The most common question I get is if lips can be lifted with fillers. Patients often ask, "Can Juvederm or Restylane lift my lips instead of surgery?" The answer is yes, but only sometimes. If the space above your upper lift is too long and you inject fillers, the filler will push the lip out instead of up. This will result in 'duck lips'. Patients who experience duck lips are usually candidates for the Upper Lip Lift. Once the lip is lifted to it's proper position, it can later be augmented with fillers. Therefore, fillers are great for augmenting the lip, but they will not lift the lip in the same capacity as a lip lift. In fact, the use of fillers can sometimes exaggerate a long upper lip and give the appearance of duck lips! The elongated space between the nose and the top of the lip can only be shortened with the Lip Lift procedure. It really is the only way to get a permanent lifting of the lips. Additionally the Upper Lip Lift produces a more youthful shape to the lips. See me discuss the lip lift in greater detail in my Lip Augmentation, Duck Lips, and Lip Lifts blog post. To better understand why some women seem to get duck lips as a result of lip augmentation, watch my YouTube video. Beautiful lips are identified by a nice cupid's bow and having the right amount of space between your upper lip and your nose. Find out whether you need a lip augmentation or a lip lift by watching this video. Following your consultation, we'll schedule a time for your procedure. No pre-op testing is required for either the upper lip lift or the corner lip lift, as the procedures are typically performed with local anesthesia. However, ideally, you should refrain from smoking and taking aspirin for 2 weeks prior to the procedure. Prior to starting the procedure, we discuss the amount of tissue to be removed in order to lift your lip to the most youthful state. Based on your input, I make the surgical markings above your upper lip. There are no surprises since it is all discussed in front a mirror together. Prior to starting the surgery you will know exactly what amount of skin will be removed for either procedure. What is Lip Lift Post-Op recovery like? As soon as your lip lift procedure is over you will be able to leave the office and go home to recover. For either type of Lip Lift, soft foods should be eaten for the first few days. You may return to work 3-4 days after surgery, but you will still be swollen and your mouth will still feel tight for the first few weeks. The sutures that I use are dissolvable, so you do not have to return to the office to have them removed. Swelling will go down dramatically within 1-2 weeks and by the end of one month, the majority of all swelling will be gone. If patients still experience redness near the incision location after a couple of weeks, these these patients are asked to apply a small amount of over the counter steroid creme for a short period of time. Dr. Rodriguez has performed hundreds of Lip Lifts and in all the cases, the redness of the scar will subside! How much does a Lip Lift cost? Can I finance my Lip Lift? Over the past decade, I have performed hundreds of Upper Lip Lift Procedures. See our entire lip lift gallery to see my patients' before and after photos to help determine if this procedure might be right for you. Surgical results do vary and each case is unique. Your first step to having a lip lift is to schedule either an in-person consultation or a virtual consultation (most often via Skype or Facetime). Local patients are able to have a complimentary consultation in person and the actual procedure requires very little down time and a single follow-up visit. Many patients fly in from all over the world to have a Lip Lift here in our Baltimore office. Out of town patients usually start with a Virtual Consultation to find out if they're a candidate for the procedure. Ideally, out of town patients would plan for a two night stay in Baltimore so they can come into the office for a follow up appointment as well, though the follow up may be virtual as well. The majority of patients fly into Baltimore the day before surgery, and fly home the day after surgery. If you are traveling from out of the country, I will provide a letter documenting your scheduled surgical date for the purpose of Visa application. Our office will also provide transportation from the airport for the procedure. Please call the office 410-494-8100 for more information.